Bangladesh and Saudi Arabia signed five memorandums of understanding (MoUs) regarding cooperation in industrial and power sectors. The MoUs were signed at the King Saud Palace in Riyadh. 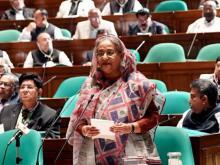 Prime Minister Sheikh Hasina witnessed the signing ceremony following her meeting with leaders of the Council of Saudi Chamber and the Riyadh Chamber of Commerce. 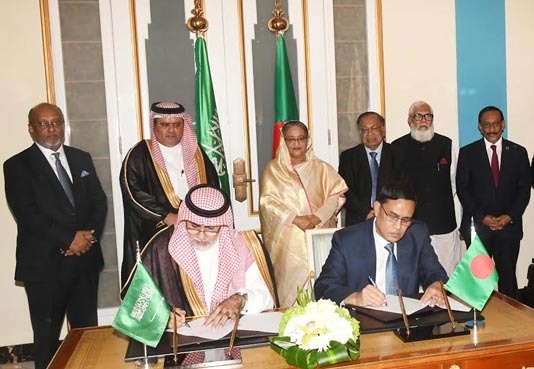 The instruments are MoU on Concerning Principles of Cooperation between Bangladesh Chemical Industries and Engineering Dimension of Saudi Arabia, MoU on Construction Cooperation between Bangladesh Chemical Industries Corporation and Hanwah Engineering of Saudi Arabia, MoU between Bangladesh Steel & Engineering Corporation (BSEC) and Engineering Dimension of Saudi Arabia, MoU between Industries Minister of Bangladesh and Alfanar Company of Saudi Arabia on development of solar power project in Bangladesh, and MoU between the Bangladesh Economic Zones Authority (BEPZA) and Al Bawany Co. Ltd of Saudi Arabia.